How to Prepare Sweet Karadai Dish for Savitri Nombu? Karadai Nonbu takes its name from the unique dish ‘Kara Adai’ prepared during Savithri nombu or Karadaiyan Nombhu. The dish ‘Kara Adai’ is cooked especially during the Karadai fast. It is eaten to break the fast observed by married women. The recipe is quite simple and it is believed that Savitri prepared this dish and offered it to God as a thanksgiving for sparing her husband’s life. 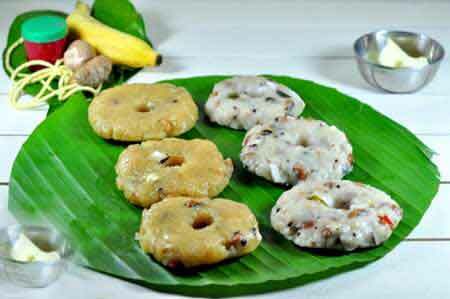 There are two types of Karadai preparation – sweet and savory. You can read the recipe to cook white karadai or uppu kara adai here. Roast the rice flour – stop when it is off white to light brown color. The consistency should be like the rice powder used for drawing kolams. Once roasted properly keep the rice flour aside. Slightly roast the Karamani and then pressure-cook till soft and drain the excess water. Boil water. The ideal ratio of water to rice flour is 2:1. Add the rice flour slowly to prepare the dough. Stir well to avoid lumps. Cook till the dough achieves a thick consistency. Add jaggery to the dough and stir well until both blends together. Add cardamom powder, cooked Karamani and coconut and stir well to blend. Cook the dough on small or medium flame. Keep stirring until the dough thickens. Make a lemon sized ball from the cooked and cooled batter or mixture and spread or pat into a small circular or disc – around 3 inch diameter and 1/4 inch thick. The mixture can be spread on hand or on banana leaf or butter paper. Make a hole in the center of the non-cooked kara adai or patties just as in a donut. Make as many as possible with the available batter. Steam the patties in an idly-cooker or pressure cooker with steamer trays. Cook for 10 minutes. In the case of pressure cooker, cook without putting the weight. Serve hot with butter or after the Karadai Puja. Cowpeas can be substituted with Tuvar dal. Make sure the jaggery is clean. If it contains sand or other particles, heat the jaggery and make it into a liquid and strain it before using. This is a general idea for making sweet Karadai; you can always be flexible in the quantity and the amount of jaggery used etc. How to prepare Savoury or White Karadai?